In some areas the situation is even worse: in the Kurgan Region, for example, where 40% of the grain to be harvested is lying under snow, a state of emergency has been declared. Siberia and the Trans-Ural area have fared very badly with weather conditions this year. A dry spring was followed by a cold summer, which delayed ripening. Then the harvest began with twice the average rainfall for the season; and the rain was followed suddenly by snow. According to the regional meteorological office, the weather has not been this unpredictable since 1979. The forecasters themselves were taken by surprise: they had forecast a favourable autumn for the farmers, which many of them were relying on. 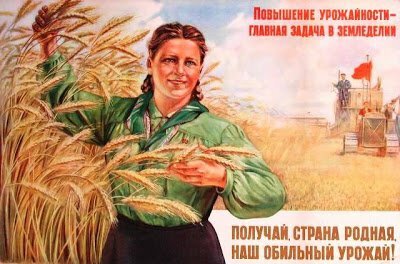 As Omsk farmer Sergei Detkov told journalists, the meteorological office had assured farm managers in person that, come harvest time, the weather would be the best for several years. Instead it turned out to be the worst. 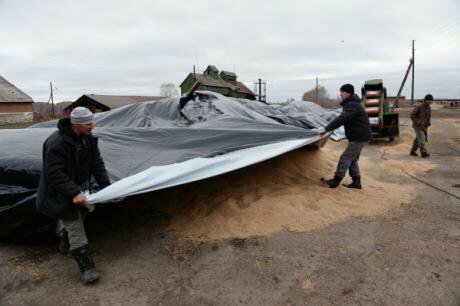 Russian farmers in Novosibirsk work to cover their grain harvest from the rain. (c) RIA Novosti/Aleksandr Kryazhev. In the Omsk Region, the situation is not quite so acute. But Ivan Nazarov, who sits on United Russia’s regional agricultural policy committee, believes the lack of equipment is still outrageous. ‘When did we ever have to harvest six square kilometres with one machine? Or six-and-a-half, like in Russko-Polyansky.’ Nazarov knows what he is talking about; he used to direct the renowned Soviet-era Sibiryak state farm. The battle for the Siberian harvest has been won! But the farmers are not celebrating.